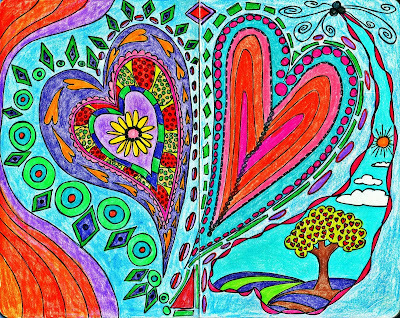 Journal art "Love Grows Here"
Tomorrow I'm having the stress test to determine why my EKG was abnormal with an inversion in my T wave. I've been focusing on my art, and not much else. Lots of heart art going on around here. I'll be posting the new work soon. Sorry to hear you are having problems that necessitate a cardiac workup. Just wanted to let you know not to be too alarmed over the inverted T waves. There are many things that can cause it. It may be as simple as a low potassium level or it could be a result of high blood pressure. It may not be anything at all. For a more accurate test your doctor should do an echocardiogram. It is painless - just a fancy heart x-ray that shows the heart in action and the blood as it flows through it. Hope all turns out well. Good luck with the test. Thank you, Rae! I believe this is the test I'm having. He did a complete blood workup, too. Plus my cortisol and thyroid. I think it was from the onslaught of panic attacks I was having. I'm feeling much calmer now and have even gotten a few nights of sleep. Amazing what a few winks can do for you. OXOXOXO, Rae!!! Take care of you and your heart. And I love your artwork. Good luck! Hope there's nothing wrong, or if there is it's something minor that's an easy fix! Loving the heart tree. Much luck with the test! I'll be sending good thoughts your way....stress can make all sorts of stuff abnormal, take it from one who had cholesterol levels of 400 @ 33. I'd not be here if they had kept that up!! what beautiful colors in this piece!!!! it's so happy. best wishes for your upcoming test. Thank you so much for your nice comment on my blog. ~~Thanks everyone. A wee bit of a hard night with some anxiety creeping back in but not as much as it had been. Superman is picking me up in 45 min. I'll be in good hands. Thank you for the prayers and good thoughts. Thank you so very much for sharing this piece of "life" with us. More than needed, to see, a heart, two, three ... an endless amount indeed. Wishing you all the best for your test. T - beginning letter of TRAUM, German for DREAM. Wishing you always happy ones and a nice Tuesday as well. I love your happy art! Hope all goes well with your test and it puts your mind at ease. You got to see my painting - very similar (I didn't copy - honest!) Love this heart - and hope yours turns out to be tickin along fine. My dad (and me) have a funny twang in our heart rhythms. My grandad had it too - and lived to be 93!! Just found you---Love your journaling! I was on a break and missed this! Hope it all came out OK.